Om Nom More: Faux Beef Terimayo "Japadog"
The other day I spotted a Japadog food truck and I looped around a block just to go back to grab a few for dinner. Heehee. I love Japadogs, especially their Terimayo Japadog with some wasabi mayo. That made me want to try to make this at home (since I'm cheap and like to try to make things at home). 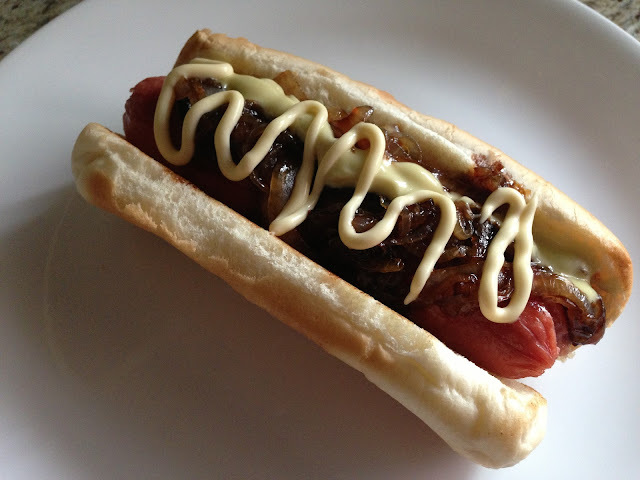 Which led to my buying hot dogs and hot dog buns the next day to experiment. Considering how I have no garlic at home, I decided to just go and experiment the other night for dinner. This is my rift on it but darn it is YUMMY! I'm definitely making this again. Hubby probably could've eaten 2 or 3 of these by himself. He doesn't usually finish my food unless I REALLY can't finish it and he didn't even need to be asked twice before he finished the rest of mine. LOL! In a medium pan, caramelize onions on low to medium-low heat. Sprinkle 1 teaspoon of sugar to help it along. Stir occasionally. In the meantime, in a small saucepan, add soy sauce paste, water and remaining sugar and cook on medium high heat until sauce thickens. Add caramelized onions into the sauce. Mix well. Set aside. Using the pan you used to caramelize the onions, split the hot dog buns and put them facedown to toast a little on medium high heat. Set onto serving plates. Meanwhile, make wasabi mayo by combining the wasabi paste and Japanese mayo. Mix until well blended. Set aside. To assemble, place hot dogs in the buns, top with onions in sauce, wasabi mayo and extra Japanese mayonnaise (optional but definitely recommended). Serve right away before someone steals it from you.